It’s important to ask yourself if staying where you are is worth the stress of living month to month on a fixed income barely able to pay the bills. Is this sense of loyalty a bigger factor than peace of mind? Or perhaps you have a large family to consider? You might have to pass on the limo ride to the airport in favor of a shuttle, but on the way, you can text them to let them know you’re considering the high life in Panama. Why Panama and why now? The cost of living in Panama is at least 1/3rd of that in the US or Canada. In some areas it’s even less. Talking with local expats who now reside in the Latin American town of Las Tablas, about 5 hours drive from Panama City, and the capital city in providence of Los Santos, I discovered what a good life would typically cost. Starting the day in a tranquil environment is the first costs savings many experience. No rush hour traffic to get embroiled in as you travel to the market. To purchase enough groceries for a week you could easily spend $25US. This would buy you more than enough fresh, non-gmo fruits and vegetables at the cost of .25 for a tomato or .75 for an avocado or a bunch of bananas for .65. A head of cabbage, an armload of kale or a basket full of fresh herbs will costs you less than$1.00. Meats are whole and not always butchered to our trimmed-down standards, but a whole chicken (with head and feet) is only $2.00 for example. One young couple told me their liberal food budget rings in at around $100 a month. If you like eating out, a plate of fresh shrimp, fried plantains and rice will put you back $4.50. If you wash it all down with a cold beer you’ll have to come up with another .75. The price of a home depends on where you choose to live since like all areas there are more sought after places than others. My recommendation is to rent for at least 3 months before buying. Do you prefer the beach or the mountains? Do you want small town or big city life? Do you need high speed internet access or can you run silent and run deep? In Panama you have a choice. 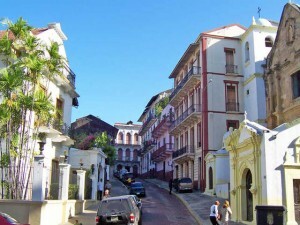 To rent a beautiful colonial style home in Las Tablas, for example, it could cost you between $400 and $500US a month. The house will be fully furnished, three bedrooms, 2 bathrooms on a piece of land that is surrounded by open space or a few kilometers outside of town the coastline of the Gulf of Panama. The closer the beach the higher the rents which could top out a whopping $1,200 a month. When you decide to buy, a starter home inland can go for about $50,000 and beach front $200,000. Utility costs are more than reasonable with water costs at $5 a month, electricity runs about $30, of course depending on the size of your place. Needless to say, these expenses are not going to break the bank. Are the local utility companies dependable? “Mostly” was the reply to this question. Life is good, but being flexible makes it worth living. It’s important that the people are friendly and welcoming. Going on a reconnaissance trip to mingle with expats and locals alike will give you the insights to life in Panama. If relocating it’s important that your new landing spot has a government that is stable, the crime rate is low and the economy is solid. You’ll want some of the amenities of a developed country and most importantly, freedom. There’s so much more to say about Panama, and I encourage you to look further into travelling to this enchanting and beautiful country. The possibilities are endless for a rewarding and fulfilled life – and this is just the beginning.